Oh there are so many games to play at the moment aren’t there? This weekend was no different with the release of Sunset Overdrive and the Evolve Big Alpha taking place. On Thursday I started my download for the Evolve Big Alpha in preparation for the weekend, hoping to get a decent amount of time on it. Friday lunch time I picked up Sunset Overdrive, and as soon as I was home I started installing it. I then got ready for my night out as quickly as I could so that I had a little bit of time to play it before I headed out. I only got through the character creation and first intro mission, but I have to say, the first impressions were good. Alas time quickly ran out, as we went out for some food and drinks. Even though it was Halloween and we went to a Day of the Dead themed night, we didn’t actually dress up. On Saturday morning I was feeling a little delicate from the late night festivities, but I forced myself out of bed to play some more Sunset Overdrive. So, what do you get if Dead Rising had a drunken one night stand with Crackdown? 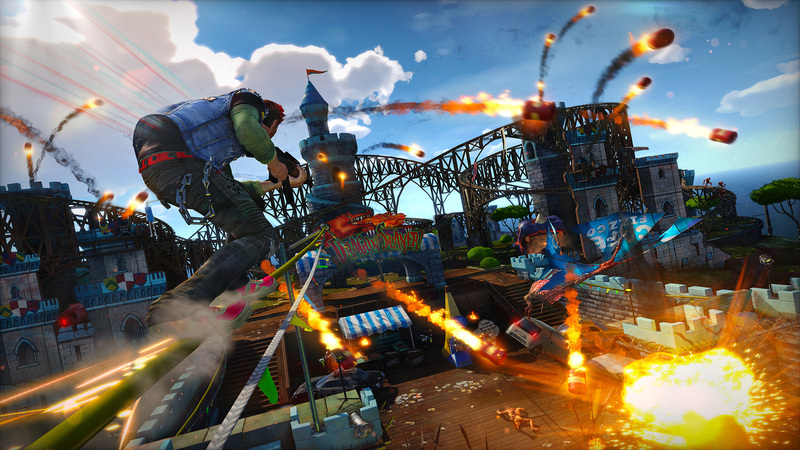 Insomniac’s Sunset Overdrive obviously! The game takes place in the fictional open world location of Sunset City. You play as a Fizzco employee. Fizzco are an energy drinks company and they are launching their new drink OverCharge Delirium XT. The problem is, is that for some reason, the drink turns everyone who samples it in to mutants. Pretty crazy right? But that is the theme of the game, crazy! In an attempt to cover up the outbreak Fizzco shut down the city, and don’t let anyone in or out. Your job is to get out, and try and save some people whilst you’re doing it. Right from the offset I noticed how bright the world is and how smooth the gameplay is. Traversing around the world is a breeze and great fun too. You can grind, bounce, wall run, flip glide, slip and slide. Actually the only thing you don’t really do is run, well you can, but it’s not really worth it. So, what do you need to go along with all this parkour craziness? Crazy guns of course. TNTeddy, a gun that shoots records, fireworks guns, plus loads more hair brained weapons available. They all offer something pretty unique and fun. Chaining together all the movement and killing stuff in between builds up your style meter, which grants you some extra awesome moves like explosions every time you bounce on something. You can also level up your guns to give you access to AMPs, which gives your arsenal a little extra oomph. If this all sounds a bit mental, it’s because it is. Insomniac have created a game that focuses on outrageous fun rather than serious gameplay. The characters you meet and weird and wacky, the dialogue is funny, and the developers have no problem poking fun at themselves during the game. It’s such a refreshing change to play something that is so much fun and so easy to pick up, it’s something that I feel has been lacking this generation so far. If you’re on the fence about it? Get it! If you’re looking for something fun to play it, get it! Basically, just go and get it, alright! As I said earlier, this weekend also saw the Evolve Big Alpha roll out. I was lucky enough to get in, it was probably because I applied about 8 times, and in the end I ended up with about 4 Xbox One codes. I’d pre loaded the game, using the Smartglass app (it’s the future man!) and was eager to play it. I understand that the PS4 version ran in to a lot of issues and was pretty much unplayable all weekend, but the deadline has been extended by 2K, so that’s a good thing! In the Alpha you had access to 8 of the 12 hunters, 2 monsters and 3 maps. During my time playing I only managed to play as the Goliath from the monster side, but I did come up against the Kraken, and it destroyed us! Team work is really essential in this game, you and your 3 other hunter buddies, must work together to track down and kill the monster as quickly as possible. The longer you leave it, the more likely it is that it will evolve and gain more power. Each hunter team consists of a Medic, a Trapper, Assault, and Support. Each has their own abilities to help you beat the monster. What I loved about the game was that it actually felt like a hunt. You drop in to the map and start tracking the beast down, looking for signs like birds being scared off, or animals being attacked and eaten. I loved catching a glimpse of the monster in the distance, and hearing your character shout it out. From the Monsters side, your first few minutes are all about trying to evolve. Running and hiding, and picking off wildlife to make you stronger. Once you get to level 3 evolution you quickly go from the hunted to the hunter. Here is some gameplay from my time as the Goliath. The whole game was a blast, and I can’t wait for the full release. I’d been looking forward to this weekend, and in particular Friday night as I’d had a night of NBA2k15 scheduled on the cards followed by watching the Bulls vs Cavs game. My wife was out for the night as it was Halloween, so I had the place to myself. Well and with some friends too. It was also an occasion to celebrate as one of my friends was in the final hours of his “Stop-tober”, quitting drinking for a month was quite the challenge, and we were in fact treating it like new years eve counting down the hours and minutes. Anyway, we played some NBA today matches on my PS4 to unlock some VC for me, then we switched to GSRR’s #1 fan’s PS4 as we’ve got a MyLeague set up on his as the Hornets that us 3 play on when we’re together. After a few games the moment came and we toasted Matt’s 31 days without booze with a nice Jim Bean maple on the rocks (minus the rocks), although myself and GSRR’s #1 fan had been drinking since the sun went down anyway. The game between Bulls and Cavs was good fun to watch, we questioned staying up for the Lakers vs Clippers. I got through 1 quarter and called it a night. Saturday feeling a little delicate too, I went to the mall with my wife for some Wagamamma’s. Firecracker chicken made me sweat any hint of a hangover away. When back I had to man up a bit and cut some wood for a bonfire party we’re hosting next weekend, so spent a few hours sawing down old skirting boards and banisters. We then spent the afternoon and evening relaxing watching films. Night at the museum, Anchorman 2 and Home Alone. It’s never to early for Home Alone. But dang it got me hyped for Christmas. Sunday I’d already got my day planned out. First up, some time on 2k15 which I’m addicted too at the moment. Plowing through the MyGM mode, but trying to save all VC I earn for MyPlayer mode. I then watched the F1 which was in Austin Texas this round. It was slightly disappointing seeing less teams on the grid due to administration issues with Caterham and Marussia. The race itself was quite lively with Ricciardo driving brilliantly to get 3rd place. I was a bit annoyed that the Williams couldn’t convert their great qualifying into a podium place. But was thrilled to see Hamilton pip Rosberg halfway through. 24 points clear now with 2 races left including the double point farce in Abu Dhabi. Next up I watched some NFL. The New England Patriots vs the Denver Broncos. I was hoping for a tightly contested game given the status of these 2 teams, but Peyton Manning had a bit of a shocker gifting the Pats a huge lead in the first half. So that’s the weekend, not much gaming from me, but a lot of sport. I’m off to Cardiff on Thursday to see WWE Live, and have Friday off to recover, so a nice extended weekend coming up for me that i’ll fill up with gaming hopefully.